One of the issues in hijab that is surrounded by the most confusion is the JILBAB. Some sisters assert that the jilbab is not fard and that "shalwar kameez and a headscarf are OK". Other sisters protest that the name "jilbab" is used in Arabic today to refer to a very specific style and type of garment and Allah (Subhana wa Ta'ala) could not have specified that all Muslim sisters are to wear this and only this type of garment. After seeing these same questions and these same claims come up over and over again, I decided to write an essay setting out the answers to the questions: what is the jilbab? and is it fard to wear one? For the purposes of this essay we are going to assume that we know nothing of Arab culture or of the types of garments that Arabs may wear. All we have to go on is the Qur'an and the Sunna, and the works of the scholars who have devoted their lives to study of the Qur'an and Sunna. After all, Muslims are supposed to base themselves only on Qur'an and Sunna. Because of this, I will refer a lot to the garment called "jilbab" and I ask my readers to suspend any knowledge they may have of what type of garment is called "jilbab". The word "jalabib" is the plural of "jilbab". Clearly, this ayah states a command for Muslim women to wear a garment which Allah (Subhana wa Ta'ala) has called "jilbab". In case there is any confusion about how the Muslim sister is supposed to go about obeying Surah al-Ahzab ayah 59, this hadith shows that the correct way to obey it is to wear the garment called "jilbab", since that is what the sahabiyat (radiallahu anhuma) did. Note that they did not hesitate or delay or make excuses: when they were told by Allah (Subhana wa Ta'ala) to wear the garment called "jilbab", they did, right away. My dear sisters, surely the meaning of this is clear enough to you. If it were halal for a sister to go outdoors without the garment called "jilbab", why didn't the Prophet (Salallahu 'Alaihi wa Sallam) allow the women to do this? But instead, he told them that they must find the garment called "jilbab" to wear, even if they had to borrow one from a friend. The rule is plain: it is a disobedience of Allah (Subhana wa Ta'ala) and of His messenger for a woman to go outdoors if she is not wearing the garment called "jilbab". Period. I really do not see any other meaning from Surah al-Ahzab ayah 59 or from these hadiths. Do you? There is one thing that all the scholars are agreed on and that is that the garment called "jilbab" is an outergarment. Their only disagreement is in how much of the body (face) the jilbab is to cover. How did the scholars derive that the jilbab is an outergarment? There are two ways to do this. First, they might just look up the definition of the word "jilbab" in a dictionary of classical Arabic. Second, they might verify for themselves by intelligent analysis of the Qur'an that the jilbab is an outergarment. We can look at both of these sources. 3) Conceal all of the body and its decorations except "what is apparent of it". Most scholars are agreed that the face and the hands are "what is apparent of it". Some scholars say that only the eyes are "what is apparent of it". It can clearly be seen from this analysis that Allah (Subhana wa Ta'ala) in Suran an-Nur ayah 31 already commands a woman that when non-mahram men are present, she is to wear clothing that is loose and opaque plus a headscarf (referred to in the Qur'an as khimar) so that with these garments, she covers everything. If this were all that was necessary, why has Allah (Subhana wa Ta'ala) also revealed Surah al-Ahzab ayah 59? For this reason, the garment called "jilbab" that has been commanded in Surah al-Ahzab ayah 59 must be something in addition to the modest clothing. The only obvious interpretation is that the garment called "jilbab" is some type of outergarment, something that is worn on top of the modest clothing commanded in Surah an-Nur ayah 31. So what is this "extra layer" that Muslim women are wearing? My dear sister, it is the jilbab! What else can it be? What we have here is that the Muslim woman is commanded by Surah an-Nur ayah 31 that when she is around non-mahram men, she must cover all of her body except her face and her hands. This rule is always in force whenever non-mahram men are present, whether she is indoors or outdoors. But when she goes outdoors, she is to wear an extra layer, an outergarment, over the clothes she is already wearing (on account of Surah an-Nur ayah 31). This extra layer or outergarment is the jilbab. The only exception to the rule regarding dress is that elderly women who do not have hope of marriage may leave off the jilbab as long as they continue to wear other clothing that covers all of their bodies. Note: This opinion has been reported from Ibn Abbas, Ibn Umar, Mujahid, Sa'id ibn Jubayr, Abu Ash-Sha'tha, Ibrahim An-Nakha'i, Al-Hasan, Qatadah, Az-Zuhri, and Al-Awza'i in Imam ibn Kathir's tafsir (commentary) on Surah an-Nur ayah 60. Convinced yet? Section C: So, the jilbab is an OUTER-GARMENT, but why? In conclusion, the jilbab is not primarily for the purpose of modesty, which is satisfied by the khimar and conservative clothes, but is for the additional purposes of identity and protection, issues that are factors of concern outdoors and in front of non Mahrams. This is why Allah (Subhana wa Ta'ala) has commanded the jilbab for these locations. In Part One of this essay, I have presented dalils from the Quran and Sunna to show that it is fard for the Muslim sister to wear a garment which Allah (Subhana wa Ta'ala) has called "jilbab". In Part Two of the essay I have presented various types of evidence and arguments that the word "jilbab" refers to an OUTERGARMENT, an extra layer that is worn over the clothing. This is the way that the scholars have understood it. The first opinion of the scholars is, in effect, that the jilbab or outergarment should cover everything but the face and the hands. There are two sub-opinions here. 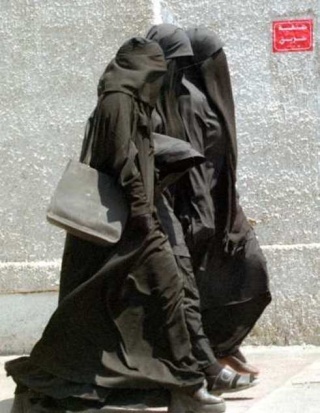 The first sub-opinion is that there must be a single garment that covers everything that must be covered. This would mean that the garment called "jilbab" must be something like the garments known as "abaya" and "chador". According to the second opinion of the scholars, the jilbab must cover the entire body except for the eyes. Just as most of the scholars who hold the first opinion allow the khimar, coat, and socks and shoes to substitute for a one-piece outergarment that covers everything but the face and hands, so most of the scholars who hold the second opinion allow multiple pieces to substitute for the one-piece outergarment or sheet that covers everything but the eyes. These multiple pieces may include a separate affixed face veil (niqab), a headscarf (khimar), a coat or cloak (jilbab), and socks and shoes. However, these scholars would strongly emphasize that the coat-jilbab is not the same as the Qur'anic jilbab. The Quranic jilbab must cover everything but the eyes. Inshallah, I hope that in this essay I have proved that the Quran and Sunna do command and make obligatory the garment called "jilbab". I further hope that I have shown that the word "jilbab" in classical Arabic, and in the usage of the scholars, is a very general term that may be translated into English simply as "outergarment". Any outergarment that meets the criteria given above is a jilbab. There are many styles that are possible, and there are many outergarments in many Muslim cultures that can be used for what the Qur'an means by jilbab. These may be called "abaya", "chador", "djellaba", "burnous", "haik", "milaya", or a thousand other names. They may even be called "jilbab". What we must always keep clear in our minds is that there is the Qur'anic jilbab, which is any outergarment that meets the criteria set out in the Shari'a; and there may also be a "cultural jilbab" that refers to a very specific style.